Copper Martini Glasses || These are so fun and pretty and only $45 for a set of two. Add them to your bar cart or use them as a hostess gift. Your next martini is guaranteed to be a special one. POW Letterpress and Engraved Stationery || These bell'Invito stationery sets are so special. This particular pop art inspired set is modern and sassy. The 5x7 cotton cards are expertly printed, then hand-painted with a fuchsia edge and paired with a rich fuchsia envelope lining. They come in a set of 12. Luxe Travel Guides|| A must-have for the traveler. This city guides are essential for trips to Los Angeles, New York and Chicago. Set in protective plastic sleeves, these pocket-sized books contain highly-curated suggestions for the finest shops, dining, spas and hidden spots. 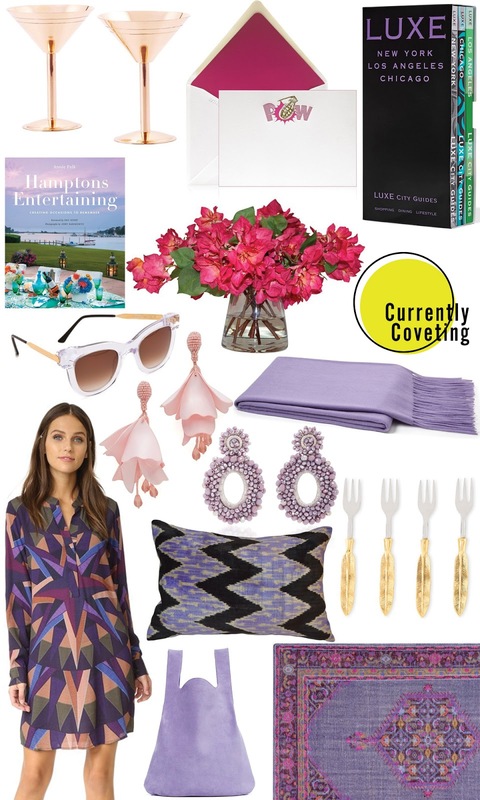 Hampton's Entertaining Book|| Because The Hamptons is so well known for it's party scene and because we don't all have the luxury of attending these fabulous fetes - this book is a must in my list. Eighteen lavishly photographed parties are featured, offering a wealth of inspiration for table settings and menus, along with entertaining tips that will serve for any occasion. Oh and more than 80 recipes are featured that will take you from spring/summer entertaining right through fall. Bougainvillea Flower Arrangement || These beautiful and lifelike silk flower arrangement will keep your home colorful and fresh every day of the year. A magnificent investment that keeps on giving day in and day-out. And you know my thoughts, you need some faux-flowers for those impromptu gatherings. Sunglasses || These french handmade sunglasses are chic and modern. The gold metal bars at the temples add a bit of luxury. Oscar de la Renta Pink Flower Earrings || These are so feminine and dreamy! The color is perfection and you can easily dress them up or down. Nothing like having beautiful flower petals around your face. Purple Cashmere Throw || Not only is this color beautiful but it's sumptuous softness and lightweight warmth are the perfect combination. Perfect for your sofa for those chillier Fall nights or at the foot of your bed, this throw will add not only color but elegance. Lavender Earrings || These are fun and easy to wear with everything- from jeans to a cocktail dress. Fabulous earrings always finish off the outfit with a bang. Mara Hoffman Dress|| This jewel toned Mara Hoffman geometric print dress is so practical and wearable, perfect for these changing temperature days. Wear without tights, a vest, and boots for cooler days, or just add a fun necklace for warmer days. It is a perfect transition piece. Pillow || I just love the color combination of this one. This lush velvet pillow is expertly crafted from fine silk in a bold ikat-inspired design and backed in solid linen.Perfect for any sofa or chair. Appetizer Forks || These are so cute and their price is right at $23 for a set of 4. They are elegant and different. Keep them for yourself or they make a perfect hostess gift that is sure to be treasured. Lavender bag || This beautiful calfskin unstructured shopper tote has the best color! Combine it with greys, blues or blacks for punchy outfit. This is a perfect, everyday bag. Rug || This fabulous hand-knotted wool medallion rug design in the jewel tone palette feels fresh and modern and sure packs a punch. In love with both earrings! Alas, I am one of those who can't carry big earrings! how I wish! Love the bag too, reminded me initially of my picotin! Perfect for shopping! The two earrings are gorgeous! everything is amazing! I have that rug and it is gorgeous! Love it! Love jewel tones and all of your picks! Simply beautiful.